We pride ourselves on offering a friendly yet professional service. Our experience, expertise and efficient approach have ensured that we have become an established and trusted name throughout the Northwest of England with a reputation for courteous professional yet very personal service. 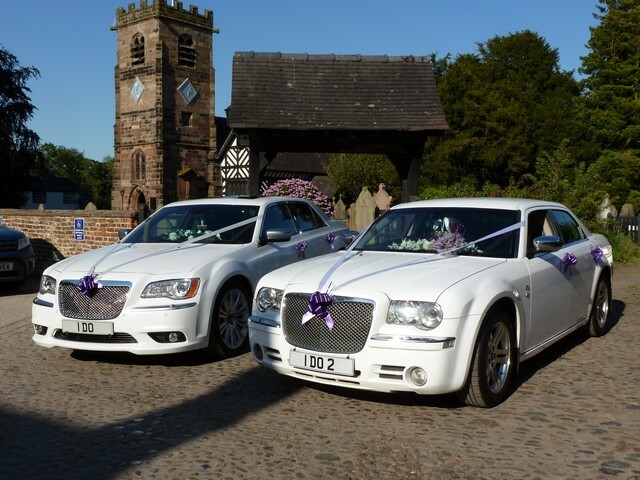 We are a family business specialising in wedding cars throughout Cheshire. We chauffeur drive the cars ourselves with other family members offering their services when required. We have the number plates "I DO", "I DO 2" and "I LUV U". 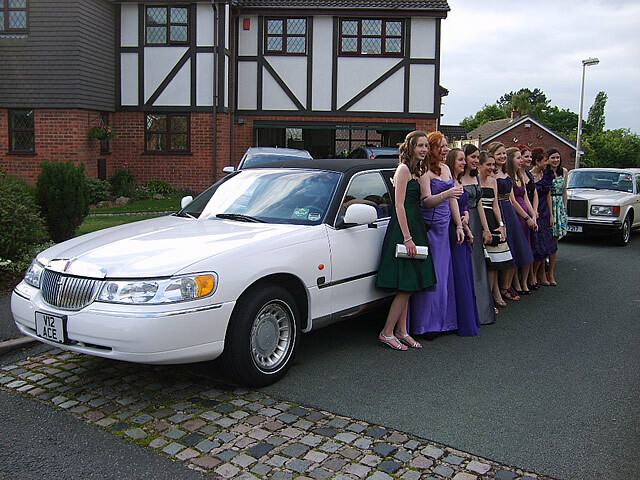 We convey the bridal party to the church or venue in ultimate luxury. 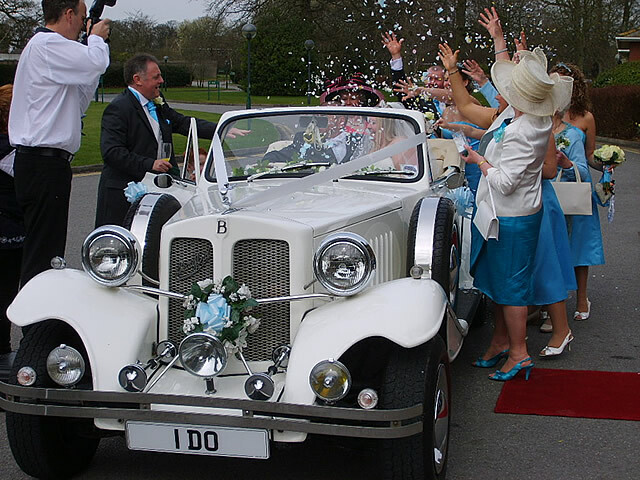 Not only do we use our personal license plates to add character, as well as a sprinkling of humour to your special day, we also coordinate the decoration of the car to match your bridal colour scheme with the flowers within the car and/or bows on the handles. Beautiful Chrysler 300 affectionately known as the "Baby Bentley GT Sport" in Pearlescent White. Due to very popular demand we have now purchased an additional later model Chrysler 300 affectionatly known as the "Baby Bentley GT Sport" in Pearlescent White (on the left) to compliment our existing car in Silk White (on the right). The new model builds on the fantastic specification and comfort of the earlier model and makes an ideal matching pair for the bride who wants to make a real statement. These are large modern saloons with soft Nappa leather upholstery, silky smooth V6 engine, high quality surround sound music system, climate control, heated seats, and every luxury imaginable. Available singly or as a pair (perhaps 'his n hers') from £275.00 each and matching perfectly with our existing fleet of white cars. The perfect choice for the modern bride. Just a small note to say "Thank you" for the superb service you gave to our daughter and her new husband last Friday (29th October). We would have no hesitation in recommending you for service, price and professional conduct, so thank you once again. Thank you so very much for providing our wedding cars on 14 July 2007. We had an absolutely fantastic day which was made so very special with your lovely cars and brilliant staff. They made us feel like King & Queen for the day. Just a little thank you for providing the fabulous cars for our wedding (8th June 2008). We had such a fantastic day which we will treasure forever. Thank you for getting me to the church on time !!! A little note to say thanks you so much for your wonderful service on our wedding day - a particular thanks for dashing back to collect my bouquet - we're both still laughing about it. Your service & the limos were absolutely first class for my hen night - we all enjoyed travelling in style - it topped the night off in style. Thanks for everything. Andrew & I just wanted to say a huge thank you for helping to make our wedding day so special. The cars were soo comfy!! We would like to thank you for helping make our day so special. The cars were lovely, just perfect for the day. We would just like to say thankyou for providing us with a fantastic service on our special day. We couldn't have asked for better and the cars looked lovely. 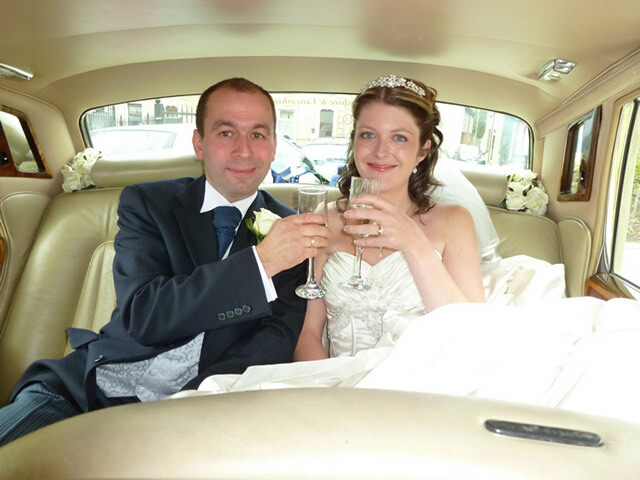 We would like to thank you for a perfect wedding car for our big day and also the great driver who kept me calm all the way to the church and kept my husband topped up with drinks all the way to the reception. Thanks for everything and we can't thank the driver enough for his help on the day.